Mobile technology will play an important role for Facebook as it tries to find new sources of revenue, but building its own device doesn't make much sense since competition in the smartphone market continues to be very tough, according to analysts. Mobile users already represent a big chunk Facebook's traffic. At the end of March, Facebook had 901 million monthly active users, and 488 million of those used its mobile products. In April, the number of mobile users surpassed 500 million. However, Facebook's IPO has put the spotlight on the company's earnings and the uphill battle it may have to monetize its user base. That is especially true in the mobile market, where today it has almost no revenue, according to market research company CCS Insight. To improve its fortunes, the social networking giant is planning to release a smartphone by next year and has picked up former Apple engineers to help with the effort, according to a story in the New York Times Sunday. Facebook has not responded to queries about the report. "I question whether Facebook needs to make its own hardware. Google needed to extend search across mobile devices with Android, whereas Facebook already has a huge amount of engagements on mobile," said Geoff Blaber, who leads mobile device software research at CCS Insight. Blaber isn't the only analyst questioning how wise it would be for Facebook to get into the hardware business. "I don't see a huge demand for a specific Facebook phone, for the single reason that Facebook is already available on every smartphone," said Francisco Jeronimo, research manager at IDC. Looking at the cost and resources needed to develop smartphones, it is difficult to see how the sums add up to favor Facebook, particularly when the current state of the smartphone market is factored in, according to Blaber. "It is a hugely intensive undertaking to develop phones, because life cycles are extremely short particularly in the Android world; there is an awful lot of margin pressure; and you have to ensure that you are competitive every release. It is absolutely relentless," said Blaber. By putting out its own phone, Facebook also risks alienating other phone makers, according to Roberta Cozza, principal analyst at Gartner. Otherwise, the company has already worked with partners such as HTC to develop phones with tight software integration and a dedicated Facebook button, but they never succeeded, according to Jeronimo. Reports in the New York Times and All Things D say that Facebook and HTC weren't put off by the failure of their jointly developed phones, named ChaCha and Salsa, and are working on new jointly developed devices. That makes more sense than going at it alone, Cozza said. But a smartphone isn't the only route Facebook can choose if the company is bent on having its own hardware. A tablet is an alternative, because the tablet market isn't a set as the smartphone market, according to Cozza. However, young people aren't into tablets as much as smartphones, she said. An alternative route to having more control over mobile phones is the further development of HTML5, which Facebook is also pushing hard. The vision for HTML5 is that applications can be developed to run in the browser instead of directly on the smartphone, and run on all devices. Changes that Facebook makes would affect more users than those of just its phone. A recent report stated that Facebook is planning to use some of the money from the IPO to buy Norwegian browser developer Opera Software, which would help Facebook boost its efforts Web efforts. 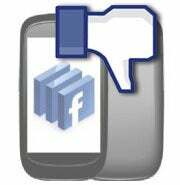 "There is a very strong argument that Facebook is in a far better position to drive and dictate disruption using HTML5 than it is through creating its own hardware," said Blaber. By purchasing Opera, Facebook would get commercial relationships with many of the world's largest mobile operators, according to market research company Strand Consult. Opera also has a presence in the mobile advertising market, an app store and knows a lot about what is going on in countries like India, Russia, Brazil and regions like Africa and Asia, it said. However, the continued rumors that Facebook is indeed working on a phone seem to have some weight, according to Blaber. "As much as my view is that Facebook doesn't need a hardware presence at this point doesn't mean it won't go down that route," said Blaber.